In his eight previous crime novels featuring Maine game warden Mike Bowditch, Paul Doiron has painted a vivid portrait of the state that he and his character call home, taking us from the timber-ravaged forests and desolate villages of Aroostook County to the drug-riddled poverty of Down East’s bogs and ice-fishing shacks. This is familiar ground for Doiron, a Maine native who once served as editor-in-chief of Down East: The Magazine of Maine, and who now lives beside one of the state’s coastal trout streams. 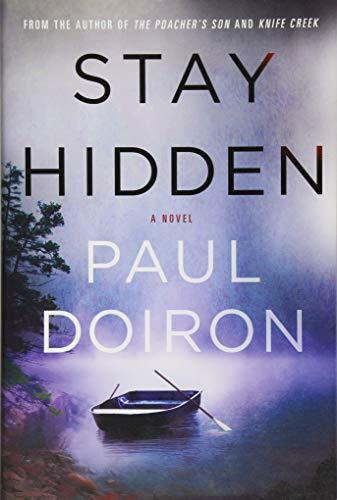 Now, in Stay Hidden, Doiron dispatches Bowditch to an isolated, fog-bound island off the Maine coast to investigate what appears at first glance to have been a fatal hunting accident. And Doiron’s characters, largely the sort you’d regret running into if you wandered into the wrong waterfront bar, are invariably well-drawn. Frustrated by islanders who are mistrustful of outsiders by nature, and who may be covering something up, Bowditch doggedly purses answers in a tale that includes drug overdoses, marital infidelity, an incompetent local constable, a wealthy hermit, a fishing boat crash, a family of drug-dealing Nazi sympathizers, and a twist about the shooting victim’s true identity. Stay Hidden, the ninth novel in this series, stands on its own well enough, but the uninitiated would be best served by starting at the beginning with The Poacher’s Son, an Edgar Award finalist for best debut novel. Otherwise, they’ll miss Doiron’s finest achievement, the evolution of Mike Bowditch. He was introduced as a hot-headed, insubordinate rookie game warden who was incapable of controlling his personal demons. As the series progressed, he failed to save his outlaw father from a lawman’s bullets, killed in self-defense, witnessed horrific acts of cruelty, barely avoided getting fired, found and lost love, and committed uncommon acts of courage. And the life he has led changed him, bit by bit, in every book. In the new novel, Bowditch has matured to the point that he is able to take orders (albeit grudgingly), follow Warden Service rules (most of the time), and earn the respect from at least some of the supervisors who once tried to get rid of him. And the last page holds out a promise that he just might find love again, or at least take a stab at it, in the next book.